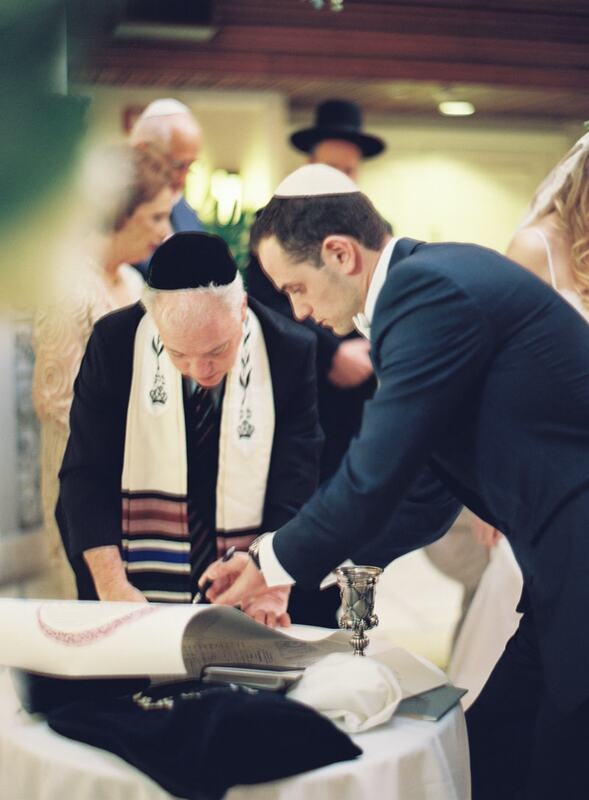 Romantic Jewish Wedding. 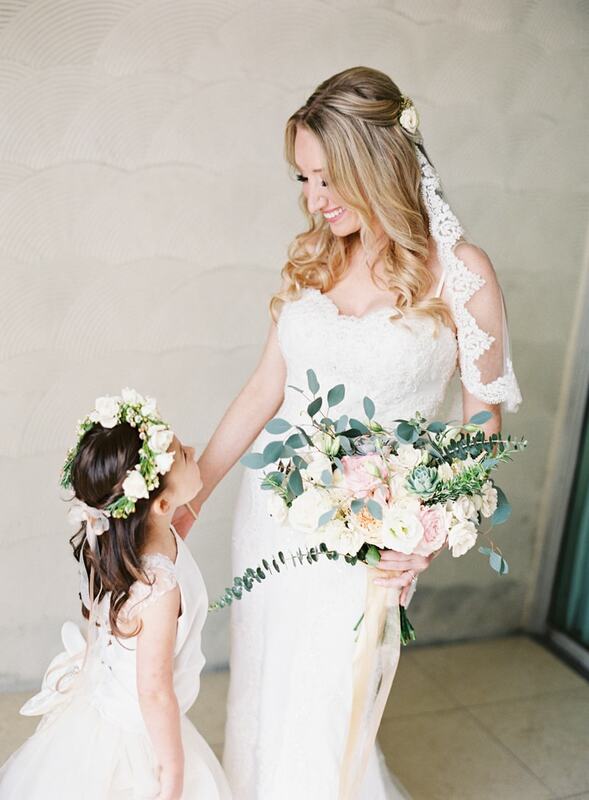 Emily and Ariel were married in a romantic Jewish wedding on Valentine’s Day. 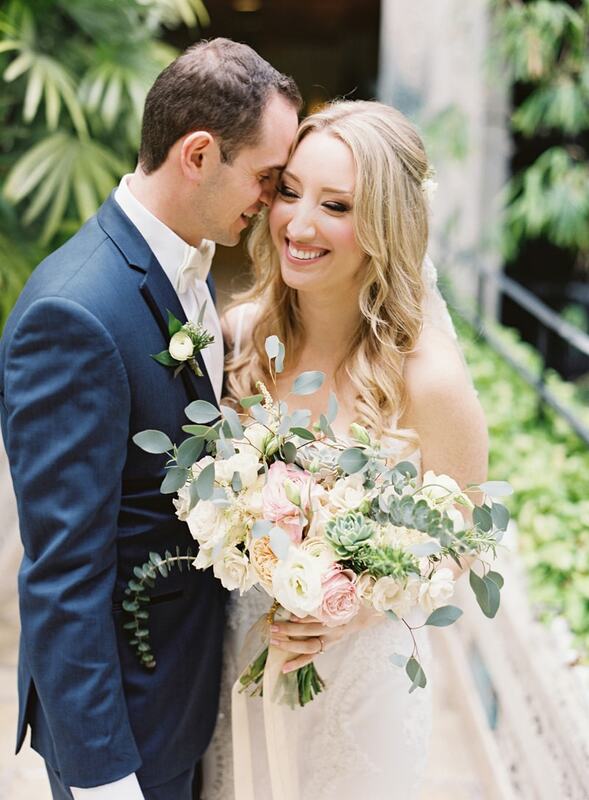 This classic and gorgeous wedding day didn’t disappoint cupid with its scores of flowers, ample candlelight, and generous love from family and friends in attendance. The two were wed at the Mayfair Hotel and Spa in Miami, Florida. Much like their invitation suite promised, the day was filled with classic and timeless qualities. The bride’s look echoed the ambiance of the day. 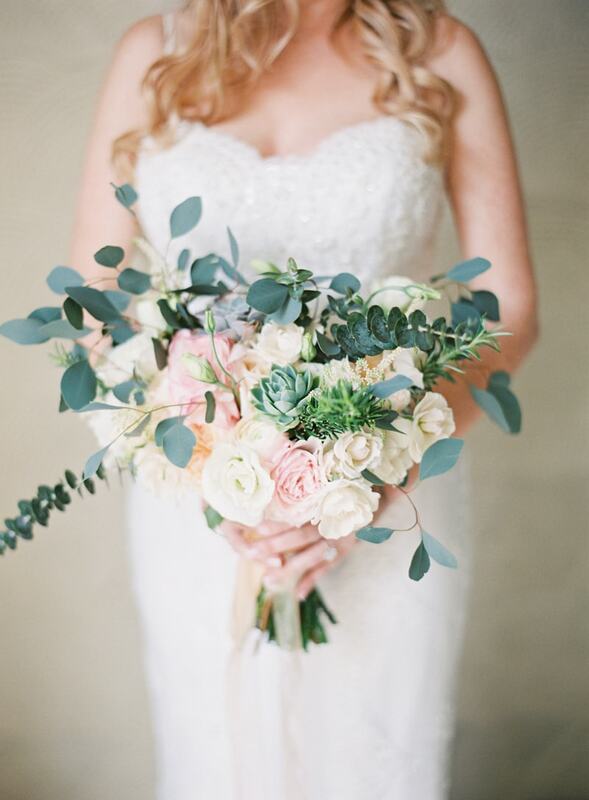 Her bouquet featured pink and white roses, succulents, and silver dollar eucalyptus. She wore stunning glittering peep toe heels to walk down the aisle and a short lace-hemmed veil to accessorize her gown. The flower girl was adorable and ready to take her place in her floral crown, white dress, and lovely smile. The ceremony took place inside the hotel’s serene Zen-inspired Asian garden. The couple were wed underneath a floral-bedecked chuppah that was the focal point of the space. The aisle was lined with eucalyptus and modern gold lanterns next to the gold chivari chairs. The attention to detail was remarkable. Emily and Ariel had beautiful vow books waiting for them at the altar and gentlemen were offered yamakas for the ceremony. With Emily in a beautiful fit-and-flare beaded gown and Ariel in a handsome blue tuxedo, the two exchanged vows in front of friends and family in a traditional Jewish ceremony. After the ceremony, Emily and her bridesmaids snapped photos. The beautiful bridesmaids wore champagne-colored dresses in a variety of styles. While Ariel chose a white bow tie for his big day, his groomsmen matched in blue tuxedos, as well, but set themselves apart with black bow ties. The happy couple couldn’t contain their excitement after the ceremony and it was written all over their faces. Guests were greeted at the reception by a lit “LOVE” sign near the couple’s sweetheart table - an ingenious and sophisticated nod to the inspiration behind their big day. The reception tables were decorated with numerous votives, modern gold lanterns, white florals, and clear china. And the couple cheerfully incorporated the Valentine’s Day theme into their wedding cake. The four-tier buttercream frosted dessert featured a charming Cupid’s arrow striking down the front with three fondant hearts to follow. They enjoyed their first dance as husband and wife and dined alongside their guests as the night fell. The bride and groom snuck away from the party back to their ceremony space to steal one last kiss alone. 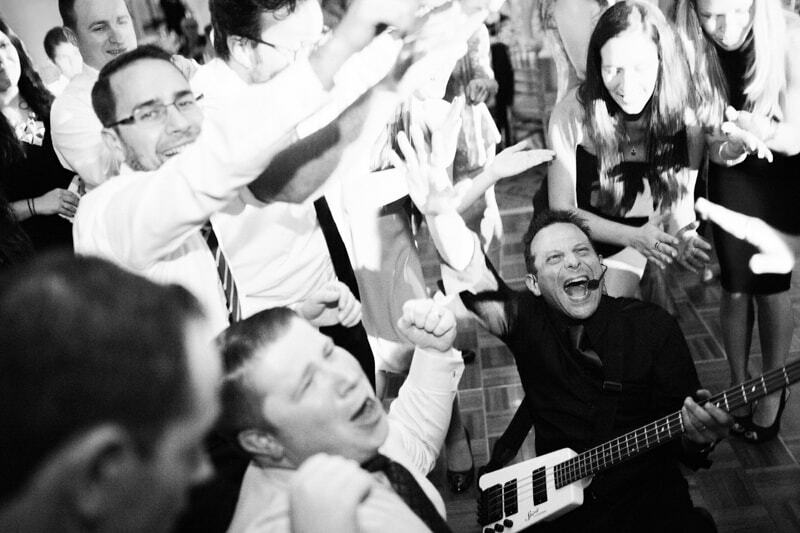 They danced the night away to the tunes of a live band and immersed themselves with the positive energy of their guests. This traditional wedding was as beautiful as it was sentimental. Emily and Ariel kept the look and feel of their special day classic with a modern touch – a style that made everyone feel the love. Cupid would certainly approve of this Valentine’s Day wedding, indeed.